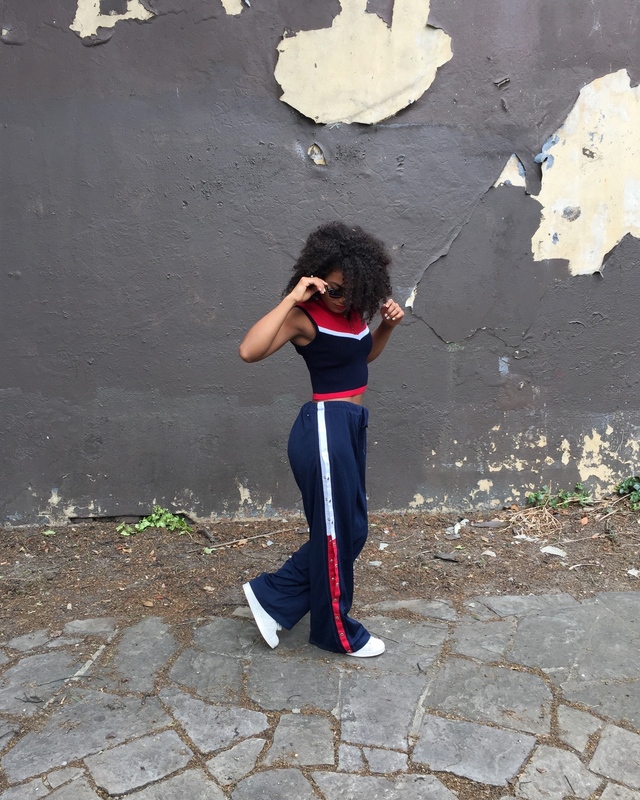 TOMMY HILFIGER//90S POPPER PANTS – Phoebe Raye. I’m definitely a 90’s baby because isn’t 90’s fashion just the best? I love wearing clothes that make me feel like myself, even if it is a head turner. (As walking to the gym with the baggiest split pants down the side turned out to be!) That’s a trait I’ve got from my mum, which is one of the many things I admire about her. She will wear whatever the F she wants regardless of what anyone thinks. Not even me. But that’s what makes her feel confident which is the most important thing about fashion. I have had my eye on a great pair of poppers and I have been searching for them for AGES! I searched so many vintage stores, but either none caught my eye or were too damn expensive, and at the end of the day, I have rent to pay. So I turned to my trusted friend… eBay. I’ve been a sucker for eBay since I was about 18 and started earning my own money. I never used to think twice about buying expensive things I don’t need and I’d turn my nose up at second-hand clothes but when the bank of mum and dad expires and you’re using your own hard-earned cash, you quickly realise the value of money, especially when you’re earning £6.19 an hour grafting in retail. I mean it sounds okay for an 18-year-old, but when you work out that a new pair of Topshop jeans cost you two whole evening shifts, you start to wonder if you can find an alternative. I’m so glad eBay exists. So many things you find on there are one of a kind items in mint condition and I even found loads of independent retailers that I like to support selling really cool stuff. I searched for 90’s popper pants and when I saw these, I had to have them. True 90’s vintage, authentic Tommy Hilfiger and for less than £40 including postage, I like to think I got a bargain there. These babies only got posted to my flat yesterday and I’m already obsessed. They are the most comfortable thing I’ve ever worn, especially on my freshly shaven legs and the light fabric is so perfect for this heat right now. I love how you can wear them so many ways for a completely different look each time. I wore them with the middle un-popped for a cheeky flash of leg and then went all the way and wore them all unfastened. These are so great for a day or night look. I’m really excited as I have another pair of poppers on the way which I’m gonna dress up a bit more for a cool, quirky evening look. I found the perfect top to go with these in Urban Outfitters. Actually not Tommy Hilfiger but it matches perfectly so I’m sure I could fool a few people and for a sportier look, I teamed with my Tommy Hilfiger sports bra.